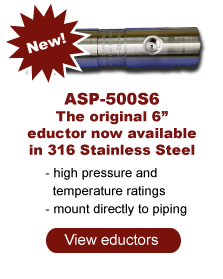 Introducing the High-Flow mini-eductor, the ASP-520R-series. A new mini-eductor designed for your most challenging applications. For gases, the Hi-Flow generates high sample flow rates especially when exhausting to high backpressures. 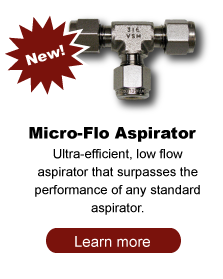 For liquids the Hi-Flow is crafted to perform efficiently with higher sample flow rates. These are some of the performance requirements that this eductor was specifically designed to deliver. These and other needs have led to the development of the Hi-Flow mini-eductor in a compact design. Often times due to environmental regulations, analyzed gas samples must be exhausted to a disposal system which has an elevated or fluctuating backpressure. Figure 1 illustrates the motive pressure required to deliver a sample flow of 1 LPM, the flow rate commonly used in ¼” sample transport lines, at elevated discharge pressures. 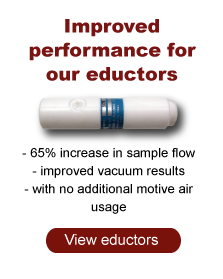 The Hi-Flow mini-eductor will also produce much higher flow rates when needed, e.g. for longer transport lines (see Figure 2). This becomes important when exhaust from analyzer vent headers (analyzer sheds) must be sent to a return that fluctuates in pressure, e.g. a plant flare. Vent pressure from the analyzers must be “isolated” from these pressure fluctuations to preserve the integrity of the measurement. 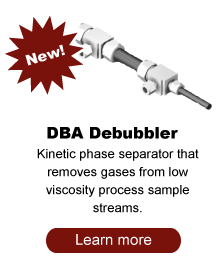 This can be sent directly at a given pressure/flow or integrated into reactive systems that isolate the analyzer from fluctuating outlet pressures. This is done by controlling the pressure of the vent header and motive gas while pumping the effluent sample gases into the fluctuating return system. These systems not only deliver higher flow rates but react to the backpressure as well, automatically adjusting the motive air pressure while minimizing air usage. Included below are performance curves for the “Hi-Flow mini-eductor” for gas and liquid use. Performance characteristics of the Hi-Flow are illustrated in the following graphs. Figure 2: These curves illustrate the sample flow delivered at various motive pressures for an eductor having an exhaust backpressure of 15 psig (blue) and 20 psig (red). When you have a liquid sample that must be “pumped” through an analyzer, an eductor offers a maintenance-free, inexpensive, intrinsically safe device that can be relied upon to deliver worry free service. Performance curves for the Hi-Flow mini-eductor are given in Figures 3 & 4. CAUTION: When using an eductor with water or a process liquid stream, the system must be liquid-liquid. Use liquid as motive to educt a liquid sample. Do not mix gas and liquids. This is extremely inefficient or completely ineffective. Use water or process liquid for the motive force when educting a liquid sample.